Lava flow from Mt. Amagi, striped pattern of soil strata and sea caves eroded by wave action. Most of the rocks we can see on the cliffs of Anagiri Coast are formed by the thick lava flow of Amagi Volcano with a striped pattern carved into the stones by lava as it flowed over them clearly showing the direction of the flow. 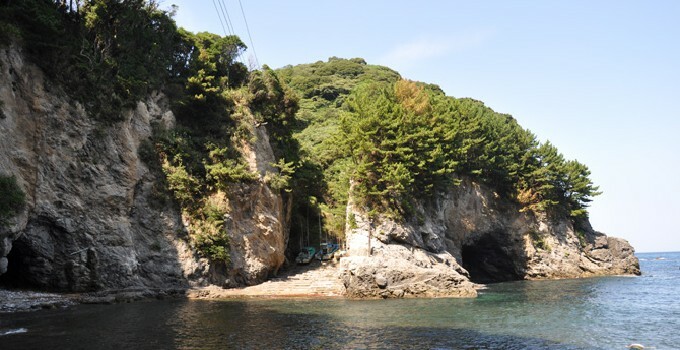 In the cliffs over the bay, visitors can see sea caves carved in the rocks. The Omuroyama Volcano is visible to the distant north, and the Izu-Kougen and Jogasaki Coast can also be seen. Look out for falling rocks. There is no parking lot nearby, but there is a small parking space available for those coming by car.